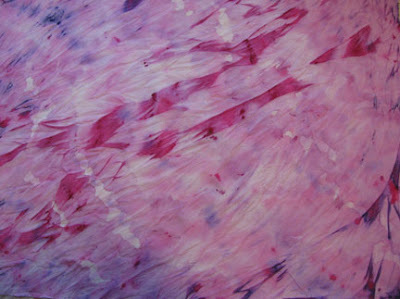 Last week we looked at how to paint your fabrics in a plastic bag in order to achieve unplanned but beautiful results. 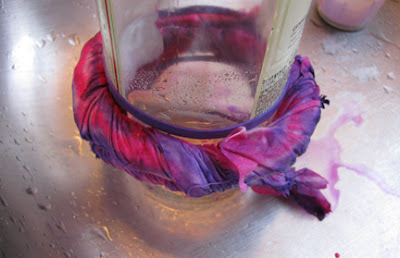 Well, here is another method that will keep you in suspense until it dries and you unroll it! 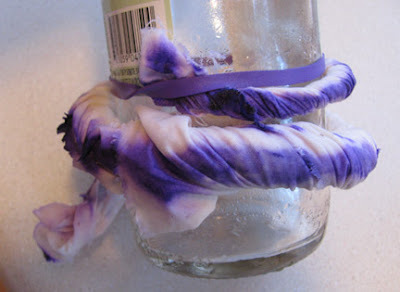 Again, you'll need to rip or cut a piece of plain muslin, gather up the acrylic paints that you want to use, and find an old bottle (wine bottles are perfect), some paint brushes, and a rubber band. Again, I will note here that I use heavy bodied acrylic paints, diluted with plain water, not fabric paints or textile medium. My fabrics are all used in projects that don't need to have a soft feel or stand up to repeated washings. 1. Make sure your fabric is thoroughly dampened, but not dripping wet. Holding diagonal corners, twist it. 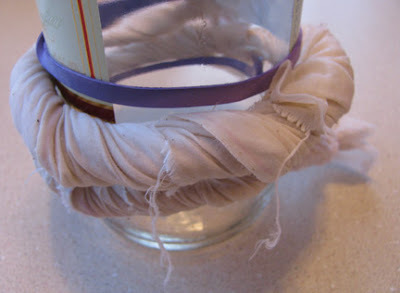 Start at one corner which you'll anchor to the bottle with the rubber band. Twist the entire piece and tuck the second corner under the band as well. 3. Add an additional color or colors to the rest of the coil. Use a lot of paint and a lot of water to ensure that the color seeps through the entire coil. 4. Let it dry undisturbed. Most of the time this will take overnight at least. 5. Unwrap and untwist the fabric, and iron it flat to heat set the paints. love this technique. 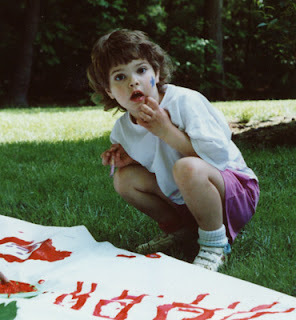 any more fabric painting ideas? clear instructions and great photos. Thanks Cyndi. Thanks Shirley! Hey, I *love* the cat with the glasses picture you've got! I love the idea of "tie-dye" without the dye. Acrylics are so much easier to work with. The fabric came out beautifully. Can't wait to see what it becomes. Love the technique. I'm about to try it with transfer dyes. I'll try it two ways. The first will be to dry it with the hair dryer and then either iron it to set the colour or heat press it pleats and all. Reminds me of tye dye, but this would be easier and less messy - the acrylics won't stain your hands the way the dye does. Caught this through Sister Diane's links over at CraftyPod. Love this technique - thanks for sharing!